I’m scared because I’m nothing but delicious dark meat. Today is Thanksgiving in Canada. I’m currently stuffed with turkey at a cottage or on my way back from it. Have a great day folks! To quote Robin, “Canadian Thanksgiving celebrates explorer Martin Frobisher’s valiant yet ultimately unsuccessful attempt to find the northwest passage.” We give thanks for courage, dear sir. Courage and adventure… and dicks. Real thanksgiving? That isn’t for another month, I know for fact it’s in November. I think you need to re-examine your facts. Clearly you’ve been given wrong info. Can I call this day…. Happy hat day? Eat as much turkey as you want, ARG! You want to be sure to reduce their numbers before the counter-attack, yes? Is Canada also at the forefront of genetically modified livestock? Yes, but not in the same sense. We militarize ours. It’s true, beware of our militant beavers. Turkey won’t go after you, there are people with a lot more meat on them than you. You´re deadly wrong. They already overthrown the government. Now they´re lurking in the dark. Waiting, planing the ultimate revenge, pulling their strings. Year after year they sacrificing their retarded brothers and sister to cover up their masterplan. Their determination will only be exceeded by their cruelty. They are definitely the retarded ones. Fear the stuffing. Fear it! I wish we had Thanksgiving in the UK, you know, another excuse to stuff ourselves silly before Christmas. Come to think of it, I’ve never actually needed any excuse to stuff my self silly….. In Canada for a year with mah partner and this is our first Thanksgiving. We’re doing roast beef, is that allowed? Pretty lame, huh? Nor do we celebrate Halloween as North-americans do. But evil mutant killer turkeys would be a big problem. This is why we must continue to eat turkeys…to keep this from ever happening. The best thing about the comment section is how well the avatars match up to the comments. 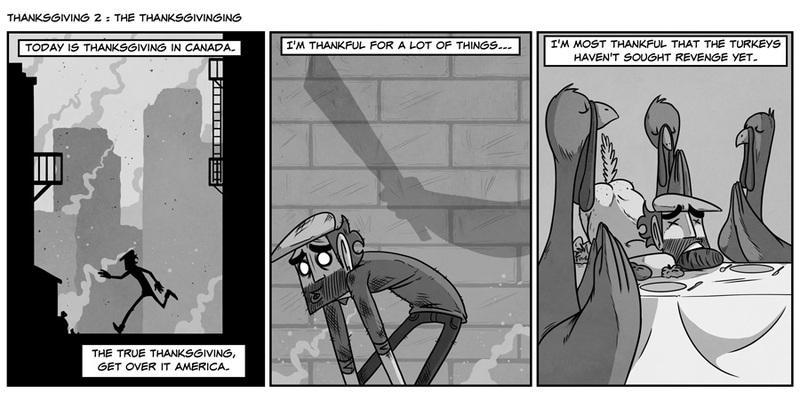 Happy Canada Thanksgiving ARG! That’s OK, because America is the one with real BEER. Thats not quite true. American beer measures its alcoholic content in weight, whereas Canadian beer uses metric liters for its percentage. They’re really about the same. I was talking about taste. I slightly disagree with your taste. S’ok I don’t buy it for taste anyway, I buy it cause it makes me feel funny. Who can taste it after half a keg anyway?